A few steps from the beach in a protected area of south-west Bali is Villa Aurora, a contemporary luxury property with tropical living areas and original design features. Four bedrooms with king-size beds, two in the main building and two in the pavilions accommodate 8 guests; all bathrooms are ensuite and have bathtubs, walk-in rain showers and separate loos. The inside living/dining area has 50” LCD TV, DVD and 5:1 cinema sound systems; outside is an 18 x 6.40 metre pool and central open-air lounge. Staff of 6 included. Ideal for weddings and events, Villa Aurora can be rented with next-door Villa Guru to sleep 18. Villa Aurora is a contemporary fusion property characterised by open-air tropical living rooms and plenty of light and space. White walls and polished concrete floors set off soaring white timber ceilings and individual décor. Two large ironwood doors open onto a waterfall with an antique Matahari, continuing to the living and dining area which is open on three sides and incorporates two ornamental ponds with heads of the Buddha acting as waterfalls. Hi-tech equipment, private chill-out areas, well-equipped bathrooms and a full complement of staff make for a delightful stay. Max no. of guests 8. Full house rental: PEAK SEASON (August 2010): 1,000 euros per night, min stay 7 nights. HIGH SEASON (July 2010; Sep 1-15 2010): 900 euros per night, min stay 5 nights. LOW SEASON (dates from April 10th not included above): 700 euros, min. stay 3 nights. Discounts for long stay: 14 nights: 10% discount; 30 nights: 15% discount. Rates per suite per night: Main suites, 350 euros (high season); 275 euros (low season). Garden suites, 250 euros (high season); 200 euros low season. House facilities may be shared with other guests. DEPOSIT REQUIRED: 50% on booking, balance of payment including bank charges to be made min 30 days before arrival. SPECIAL EVENTS: please enquire. GOVERNMENT TAX: 10%. STAFF GRATUITY: 5% service charge is not included in the final bill; a staff gratuity will be much appreciated. 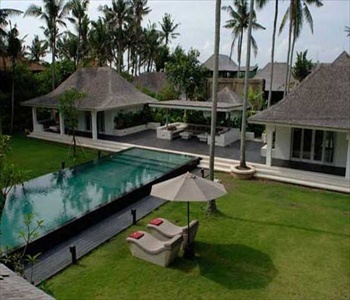 Villa Aurora can be rented in conjunction with neighbouring Villa Guru, total occupancy 18 guests. STAFF: Services of villa manager/butler, junior butler, chef, housekeepers, engineer, gardener, security officer and security guards included. HOUSEHOLD COSTS: Electricity, water, cleaning, gardening supplies and local taxes included. Rates include welcome drinks on arrival and 24 hours� free Internet connection for all guests. In addition, guests renting the entire house will receive complimentary breakfast, lunch or dinner, complimentary welcome massage and transfer to airport. NOT INCLUDED: Baggage handling, telephone, fax, telegram, and Internet connection charges; laundry service, spa and beauty treatments, food, soft drinks/liquor; personal items and expenses; any excessive cleaning required upon departure; car rental. There are no service charges, but tips given to the staff are highly appreciated. Services offered on request: VIP airport service to avoid long delays at immigration; car and motorbike rental. Special events and dinners catered for; the chef offers international and Indonesian cuisine. Personal trainer; in-house spa services: massage, facial, pedicure, manicure, etc. Nanny service; max 1 cot for babies can be provided on request. Laundry service.